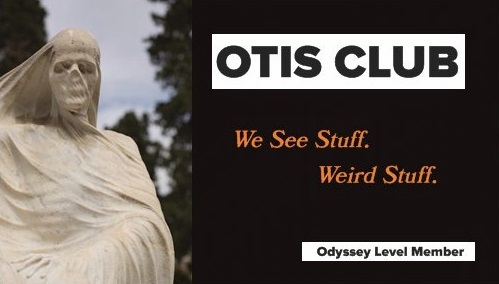 OTIS (Odd Things I've Seen): Eating E.T. October 30, 2012 — So the other night we autopsied an alien and then ate what we found. Thanks, Toys R Us. If Cartoon Network or Nickelodeon has ever lightened your living room, then you’ve seen the commercials for the Dr. Dreadful line of playsets. They’re made by Umagine, a subsidiary toy company of Spin Master. And I mention that because I believe we’d all be better citizens if we knew where our toys came from. Dr. 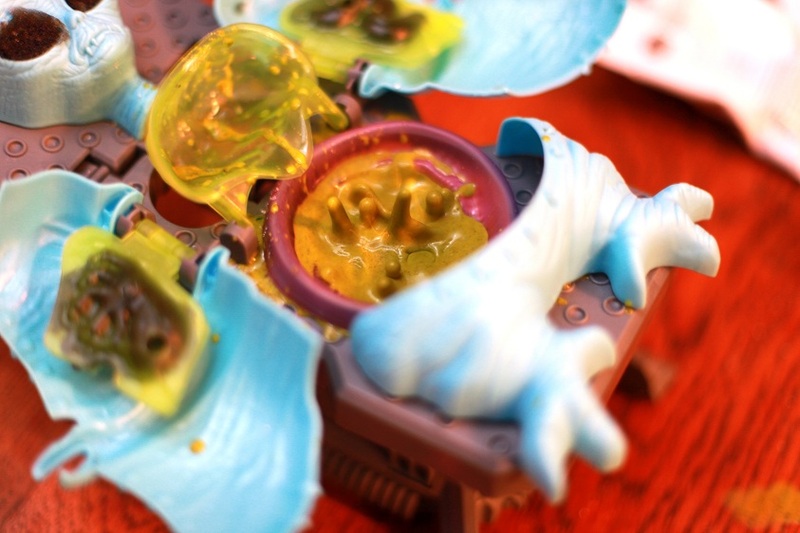 Dreadful is a line of toy lab equipment that lets kids pretend to do mad-scientist-type stuff followed by mad-man-type stuff. Grind up organs…and eat them. Hatch spider eggs…and eat them. Dig out zombie brains…and eat them. It’s like an Easy-Bake Oven market-tested on the children of Ed Gein. We recently picked up the Dr. 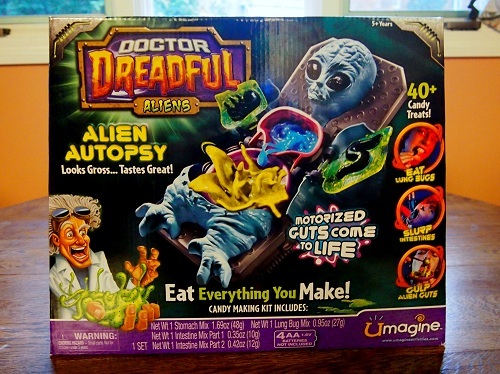 Dreadful Alien Autopsy set to try it out. First, because it’s the newest set, so every toy store had it stocked. But mostly because I have a fondly worn place in my memory banks for the FOX channel’s Alien Autopsy: Fact or Fiction special hosted by Jonathan Frakes back in the mid-1990s when The X-Files had the country at the peak of extraterrestrial paranoia. We will get back there one day. I promise. I’m not going to lie. I was really looking forward to this. The kit took a bit of quick assembly. Nothing involving tools, really, other than reaffixing a battery cover. 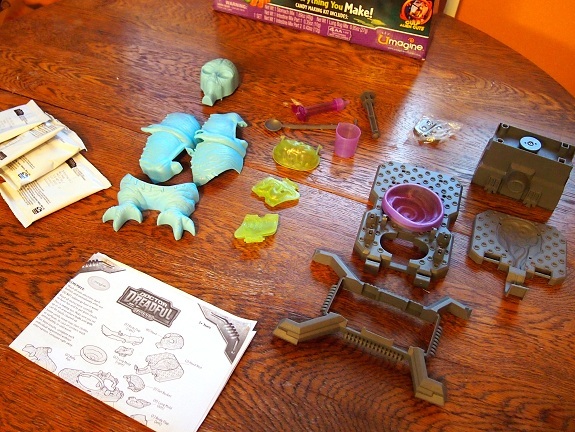 Just some easy and satisfying snap-together pieces and the insertion of the batteries that were not included. I even snapped the lungs in backwards, and everything still worked out okay. Life should be a lot more like that. From the neck down, the alien was extremely bottom-heavy, much like E.T. himself, making it look as if waddling was its primary means of locomotion when it was alive. From the neck up, it’s the classic big-eyed gray alien that abducts the most backwoods of our own species. 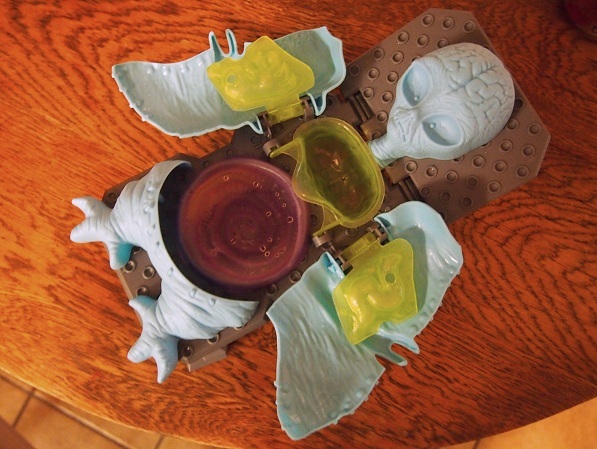 Its eyes were hollowed out, though, as molds for edible eyeballs. And the whole creature was colored sky blue because there was probably a sale on that color of plastic while it was being mass-produced. 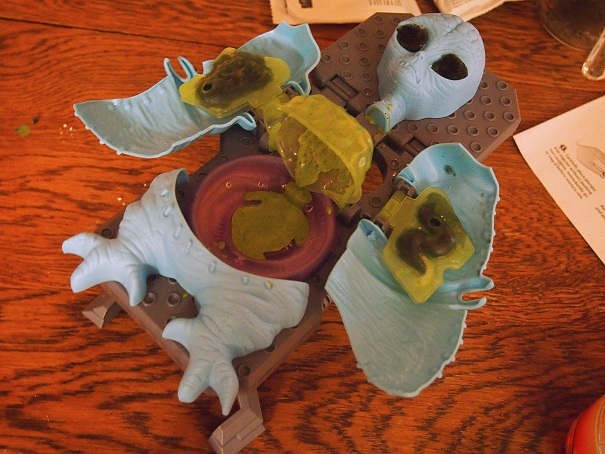 It lay elevated on a gray autopsy table, and its body hinged open to reveal more cavities to use as molds. 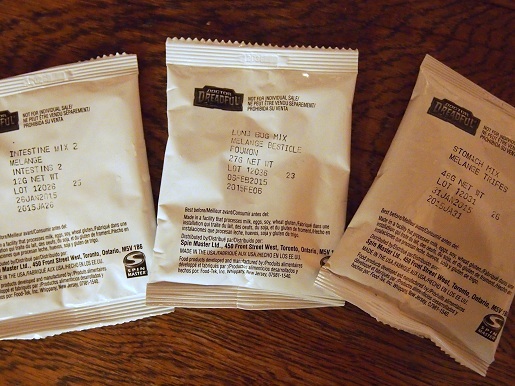 The coolest pieces in the whole set, though, were the packets of candy powder that bore lurid names in the most mundane of typefaces on generic white packets. If there were such a thing as intestine mix, lung bug mix, and stomach mix, this is exactly how they would be packaged for shipment. Anyway, the directions are the same for whatever you’re creating, Mix the candy powder with some water, inject it or dump it with the included syringe or spoon into one of the molds incorporated throughout the interior of the alien, stick it into the fridge until it hardens, and then peel it out and consume, ideally laughing maniacally in front of the most squeamish person in your family. It was all pretty simple, but took a little bit of practice if you wanted the product to turn out like it looks on the box. The only bummer was waiting while the candy set up. Puts a dint in play time when your toy’s sitting in the fridge. The coolest effect was the stomach. 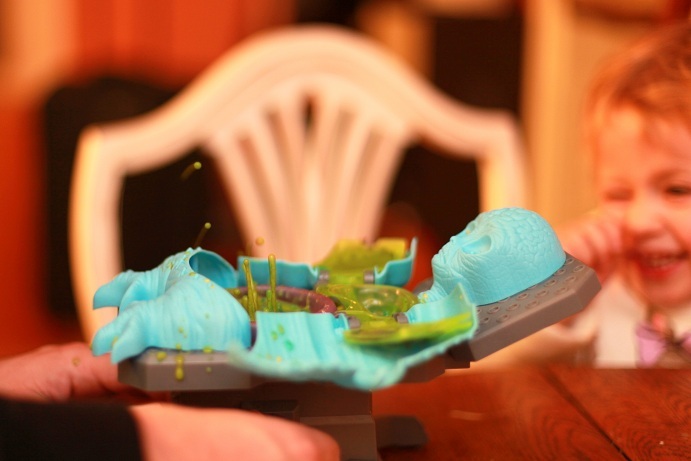 A simple AA-battery-powered vibrating disk shook up a rubber purple membrane that made the viscous green goop you poured into it jump like a sped up version of the bottom half of a lava lamp. As you can see by the pictures, it worked really well, as long as you had the right amount of goop in there. 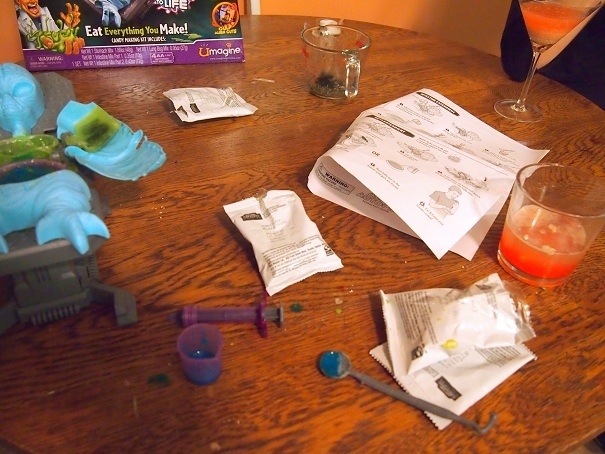 You know that you’ve done it right when you end up with a mess all over the kitchen table. And, actually, mess is how it all ends up. You get tired of doing things exactly right and just end up pouring things together and changing the mix ratios and spilling, spilling, spilling. Oh right, I almost forgot. Then you eat everything you made. It’s one of the few toy boxes that comes imprinted with its own FDA-mandated nutritional information. A lot of zeros in that black and white grid. The candy comes out like gummy candy or fruit snacks and that’s pretty much how it all tastes, too. Except bad. Like plasticky fruit snacks. That’s a good thing, though. Because if they were good and you developed a taste for them, you’d be in trouble because it’s a limited supply of candy powder and a lot of effort to go through just for a bite or two. Plus, if I’m eating alien intestines, I want them to taste kind of bad, else the whole conceit is just wasted. Anyway, it’s one of those toys a kid will get a lot of mileage out of, just not in the way it was meant to be played with. We’ll probably not use it as a candy maker ever again. 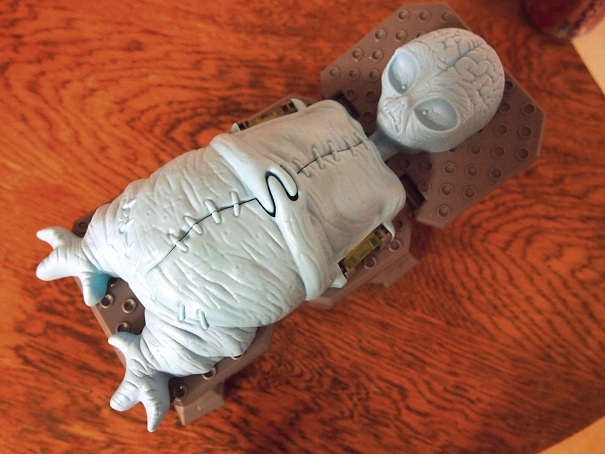 But we will have other toys operate on the alien and we’ll fill it with whatever we have on hand. And, at the very least it will end up as a shelf decoration in front of my copy of Barlowe’s Guide to Extraterrestrials or Captured! : The Betty and Barney Hill UFO Experience. It was all fun and games until we watched E.T. : The Extraterrestrial the very next night. Then we just felt bad.